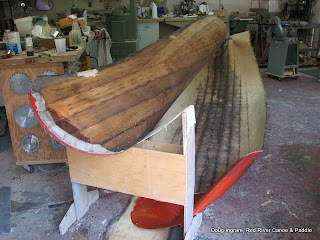 This is a rare canoe for Manitoba, even if it is one of the most common wooden canoes in the United States! 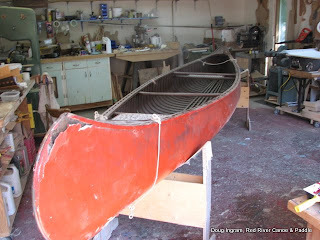 It is an Old Town "OTCA" (Old Town Canoe model A). 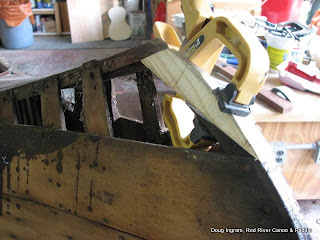 If you look closely, you can see the long mahogany decks typical of this canoe. The bottom shot shows just how old and frail the old canvas is. And onto the usual stem repairs...pretty soon I have to sand the interior and get that vanished. 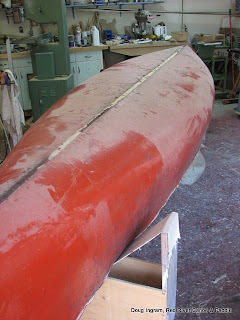 This canoe would have benefited from stripping the old varnish, now a deep chocolate brown, and re-varnishing. Due to budget constraints, the owner is single and in her '80's! that isn't going to happen during this restoration, nut will be left to future generations to undertake.